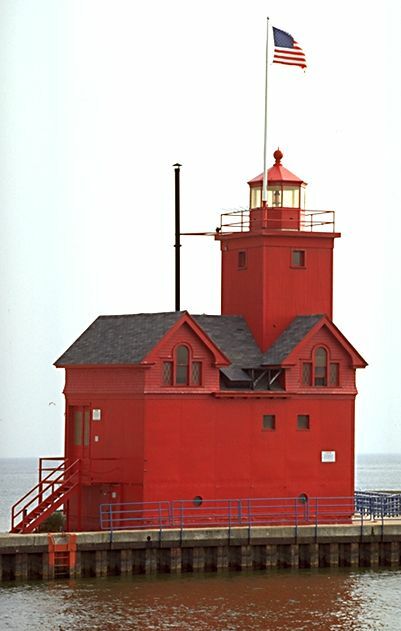 They call this light "Big Red," and like most of the lights on the eastern shore of Lake Michigan, it sits at the end of a pier. The unusual twin-gabled structure was built in 1907, and it reflects the Dutch influence in the area. In 1936 the current light tower was added to the top of one of the gables, and the entire building was covered with steel plates. 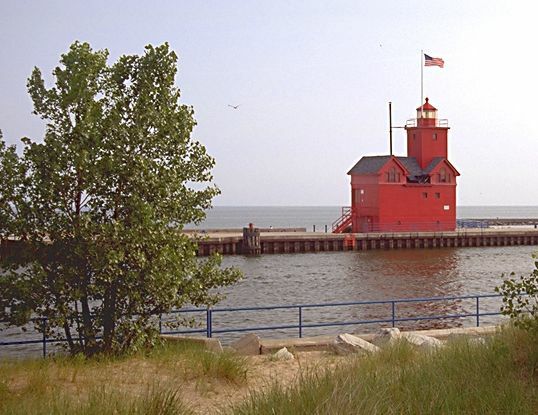 The light sits across the channel from Holland State Park. It's a lazy-summer-day kind of place, with benches lining the park along the channel, and a handful of not-too-serious fisherpeople intermingling with handholding strollers. You can visit the light by turning onto Ottowa Beach Rd. off River Ave. Follow the signs to the State Park.